The Creative Workshop Central is pleased to announce the arrival of the book, 21 Steps to Better Relationships: Find More Balance with Others, at an online bookstore near you! 21 Steps... delivers 21 bite-sized portions of inspiration designed to help you find better balance in your relationships—regardless of who they are. Find links to the books and eBooks at: 21stepstorelationships.com, or at Amazon and other online retailers. 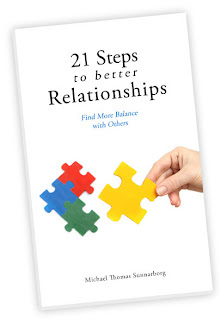 I am looking forward to hearing the stories of how 21 Steps to Better Relationships is helping YOU find more balance in your connections with others. Remember: it all starts with you. Connect with yourself; Connect with others; Connect with the world. of courage—to move in the opposite direction. We are all gifted with powerful thoughts, feelings, and intuition. Taking time to listen to our intuition and choose responses to our thoughts and feelings wisely will increase our chances of experiencing harmonious interactions. To soften your stance is to step back from your natural impulse to speak or act with power and force and either choose a gentler response or none at all. Sometimes nothing is the best thing to say and often the best thing to do. When we soften our stance, we become aware of the impact we have on those around us and learn to respond in appropriate and effective ways. Even when we are very passionate about something—which can create more intensity and enthusiasm—we can consciously choose to pause, breathe, and think before speaking or acting. By calming ourselves and resting in our perspective, we can choose how to respond to our thoughts and feelings with calm confidence. Our interactions with others provide the best opportunities for us to learn about ourselves. Through observation and feedback, we can learn how to soften our stance and pay attention to our approach. We can learn to discern between impulse and intuition, see the bigger picture, and consider our options before our actions. Soften your stance to give yourself and others more room to connect fully. When Heidi learned she could soften her stance, she had a personal epiphany. Her natural inclination was to be vocal and outspoken, but she realized that she didn’t always need to share her thinking. Heidi realized she could pick and choose where and when to focus her energy. When she committed to not doing and saying her first impulse, others around her were able to step up. Within a month, Heidi's blood pressure went down, her happiness went up, and her relationships improved. Heidi discovered a new type of personal power. · In which areas of your relationships could you benefit from learning to soften your stance? · In what ways might softening your stance change your connections with others? Tired of pushing your pitch? Remember that we learn the most by sharing ideas through collaboration rather than collision. This week, pay attention to the next time you’re asked to take action or you’re trying to get your point across. Pause, think, and try softening your stance. Notice how it shifts your energy and the energy between you and others.